Evan met Richie during early childhood and has witnessed his physical changes brought on by Friedreich's Ataxia from a firsthand perspective. 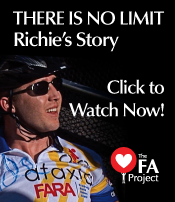 Rich's ability to accept his diagnosis with FA in a dignified manner and use it as a positive motivator in his life served as Evan's inspiration to lead The FA Project. Evan is privileged to call Rich Currier a friend and hopes that other individuals dealing with FA or close to those who are will use Rich's story as a source of encouragement in their efforts to live the best life possible. Evan resides with his loving wife Megan who is the Director of Chatterboxes, a pediatric speech-language pathology practice located in Newton Centre which she founded in 2005. Evan and his wife Megan cherish time spent with their young daughter Olivia at their home in Boston’s Beacon Hill neighborhood. During his spare time, Evan enjoys spending time at the beach in Cape Cod and Florida, snowboarding, golfing and anything that involves laughing with family and friends. Evan can be reached anytime at evan@TheFAProject.org.